"Then came the Mountain Trike, and suddenly my horizons expanded. Now I can go up hills knowing that coming down will be relatively easy..."
Although nearly 76 years old when I suddenly lost my left leg (an above knee amputation), I was still very active in the hills, and had enjoyed several good winter walks (ice axe and crampons) in the couple of months before disaster struck. As I was too old to qualify for a sophisticated artificial leg, I thought my days of walking among our local Lake District fells were over. Although I could walk up reasonably steep slopes, walking down was just too difficult and this severely limited my options. Then came the Mountain Trike, and suddenly my horizons expanded. Now I can go up hills knowing that coming down will be relatively easy .... and fast. In fact, quite an exciting ride! So, if the slope is right and the support party is available, I can now manage an ascent of up to 1,000 ft. It is extremely satisfying to be able to revisit some favorite summits. The Mountain Trike always receives a great deal of attention, with admiring glances wherever I take it. "Can I have a go?" is a standard question by able-bodied people when they see it for the first time. 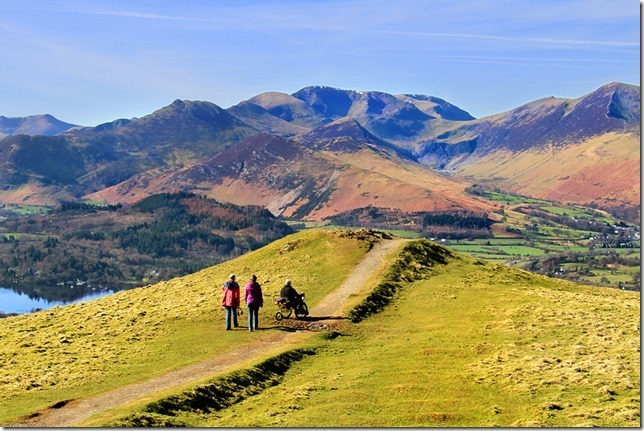 Picture is of Alan descending Latrigg, Alan’s first summit achieved a month after taking delivery of his trike.